But environmentalists' concerns remain, especially when it comes to cross-border EU protected sites and issues like water and air quality. 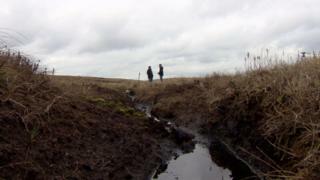 Spokesperson Emily Hunter said there was already "weak" environmental governance in Northern Ireland. "We're the only part of the UK that doesn't have an independent environmental protection agency but we don't have a government to put anything in place to replace what we're losing from the EU," she said. "So we're in a position where we could easily fall behind the rest of the UK." Dr Viviane Gravey lectures in European politics in Queen's University and specialises in agriculture and environmental policy. "There was a mechanism there to deal with that and ensure that Ireland would pay most of the cost of repatriating that waste," she said. "Sometimes shared rules mean that you don't have any problems arising, but it also means that you have common ways of dealing with a problem and there's a procedure in place, and that what's we risk losing." There are lots of "interesting discussions" going on in the rest of the UK about what will replace EU oversight, but in Northern Ireland, those talks are not happening. Academics have also raised concerns about the amount of power that Northern Ireland's Department of Agriculture, Environment and Rural Affairs (Daera) will have to interpret conservation laws after Brexit. A paper by Dr Ciara Brennan from Newcastle University and Dr Mary Dobbs from Queen's University points out that where big infrastructure projects affect protected sites, Daera will be responsible for advising on whether there is an "overriding public interest" in proceeding. The academics suggest planning officials in infrastructure would be asking approval from colleagues in Daera, a situation which, they claim, could lead to "conflicts of interest" where "the government is seeking approval from itself". You can hear more on this subject on BBC Radio 4's Costing the Earth programme.